Let Jakprints fold and bag your apparel for retail. Heat-sealed polypropylene bags are 4 ml thick. Final piece measures 10×13" with apparel packed inside. Upgrade with apparel size stickers on the bag’s surface or add a custom card blow-in with a special offer, more instructions or just a message about who you are. Select "Polybagging" on applicable product pages under the "Upgrade & Finishing" section. Want size stickers? Create a Custom Quote. Want a custom blow-in? Create a Custom Quote and tell us about it. Polybagging: Just select that option on the product page. 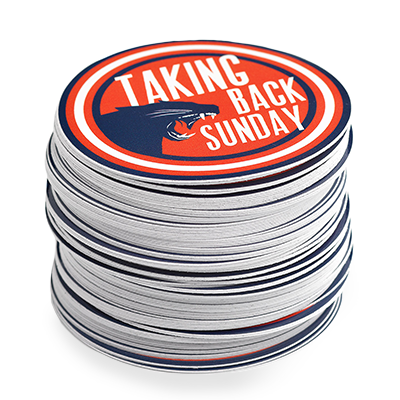 Size Stickers: Create a Custom Quote and tell us you want them. Do you already have a card you can send us? Do you need Jakprints to print them? Let us know what size they are. Let us know how many you have. Let us know when they'll be arriving and a tracking number. Have any more questions? Give us a call, we're happy to help.